WHAT IS IT? WHEN IS IT? WHERE IS IT? “AND when they shall say unto you, Seek unto them that have familiar spirits, and unto wizards that peep, and that mutter: should not a people seek unto their God? for the living to the dead?" – Isa. 8:19. Why do Seventh-day Adventists seek unto the Pentecostals – babblers in tongues, mutterers and peepers that claim they are speaking in the tongues of the Holy Spirit? Is it because there is no prophet in Israel that they must seek information on the outpouring of the Pentecostal energy from those who believe in Sunday sacredness, life after death, and have familiar spirits? Is God helpless, that He is not able to send Seventh-day Adventists a prophet, even a live one, to give them direction? In the days of Saul, David was God's anointed prophet; yet, Saul would not humble himself to seek unto David for the living God; instead, he went to the witch of Endor and suffered the dire consequences. Why is it Seventh-day Adventists refuse to listen to the voice of God, THE BRANCH, among them and prefer to go to Sunday keepers for light? What a pity! God's poor sheep have no Shepherd to lead them aright and all the while refuse the Shepherd God sends to keep them in the way everlasting. "When Christ passed within the heavenly gates, He was enthroned amidst the adoration of the angels. As soon as this ceremony was completed, the Holy Spirit descended upon the disciples in rich currents, and Christ was indeed glorified, even with the glory which He had with the Father from all eternity. The Pentecostal outpouring was Heaven's communication that the Redeemer's inauguration was accomplished." – The Acts of the Apostles, pp. 38, 39. "But after Christ's ascension His enthronement in His mediatorial kingdom was signalized by the outpouring of the Holy Spirit. On the day of Pentecost the Spirit was given." – Christ's Object Lessons, p. 120. Jerusalem upside down were not the most important events of the day of Pentecost. The most important event was that Christ was coronated, inaugurated, and enthroned amidst adoring angels, in the Sanctuary, and received His mediatorial crown in His mediatorial Kingdom. 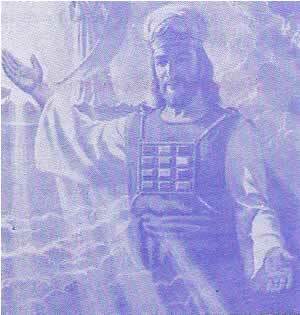 Since that time, He has been our Mediator in the Sanctuary above (Heb. 8:1,2.). Why was Christ crowned in a mediatorial Kingdom and not in the civil Kingdom for which the disciples were looking? "They asked of him, saying, Lord, wilt thou at this time restore again the kingdom to Israel?" Acts 1:6. 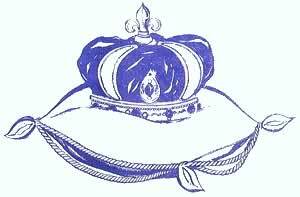 "The crown removed from Israel passed successively to the kingdoms of Babylon. . . " – Education, p. 179. Jesus knew they wanted to know the time of the restoration of the civil crown that Zedekiah lost to Nebuchadnezzar, king of Babylon. "And he said unto them, It is not for you to know the times or the seasons, which the Father hath put in his own power." Acts 1:7. Then Jesus told them He was to be inaugurated in His mediatorial or spiritual Kingdom in heaven and that they would at that time receive the outpouring of the Holy Ghost. (Acts 1:8). Not yet, was it for them to know the times and seasons for the restoration of the civil crown to Israel which His Father had reserved in His power. Because of Israel's sins, she lost her civil crown to Babylon. Nevertheless, when God gave Nebuchadnezzar the civil crown of David to rule the world, He did not give him the religious crown of Divine interpretation because He gave it to Daniel, a Hebrew. This is why Nebuchadnezzar could not understand his dream. Jesus knew that Daniel spoke of the restoration of the civil crown (Dan. 7:21,22) and that it would take place after the Ancient of days began the Judgment and after 1844, when the religious rule was restored to the remnant. "Until the Ancient of days came, and judgment was given to the saints (Seventh-day Adventists) of the most High; and the TIME came that the saints possessed (civil crown) the kingdom." – Dan. 7:22.
earth, as it is in heaven." – Matt. 6:10), the Seventh-day Adventist leadership, up to date, refuse to have it. However, our Jewish brethren desire the civil crown. "The disciples of Christ were looking for the immediate coming of the kingdom of His glory; but in giving them this prayer Jesus taught that the kingdom was not then to be established. They were to pray for its coming as an event yet future. But this petition was also an assurance to them. While they were not to behold the coming of the kingdom (of Glory) in their day, the fact that Jesus bade them pray for it, is evidence that in God's own time it will surely come." – Mount of Blessing, p. 159. "Christ is coming to establish His kingdom on the earth." – Testimonies, vol. 9, p. 63. 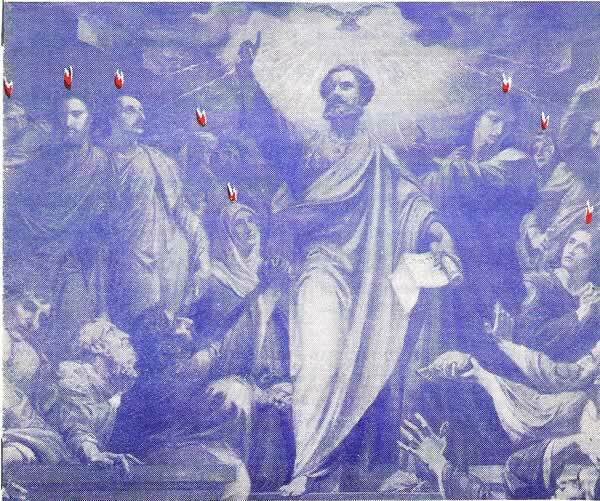 Remember, Pentecost fell on the disciples in the land of Israel, in Jerusalem on Mt. Zion. The Seventh-day Adventist headquarters is not in Israel today, or in the city of Jerusalem, and, at the present time, they have no desire for a change. The Scripture says that after Jesus was born and caught up to His Father's throne, then, the woman, God's church, fled into the wilderness with two wings of a great eagle into the Gentile lands (Rev. 12:5,6,14). There, she was to be fed for the space of 1260 years ending in 1798 according to the prophecy. Since 1844, the church has been classified as the remnant which keeps the commandments of God and has the testimony of Jesus. She is yet in the wilderness (Rev. 12:17) under Gentile rule. In considering the position of the church before God in her relation to Pentecost, we must remember that she is not in the land God promised Abraham and her headquarters is not in Jerusalem. To find out the truth concerning the Pentecost which applies to us as a people, we will have to take a look at the church in the wilderness in the days of Moses and see the type of Pentecost they experienced (Isa. 11: 16). Consider the children of Israel when they came out of Egypt and camped at Mt. Sinai in the wilderness of Sin with Moses as their leader. The Bible says, "Like as it was to Israel in the day that he came up out of the land of Egypt." – Isa. 11:16. 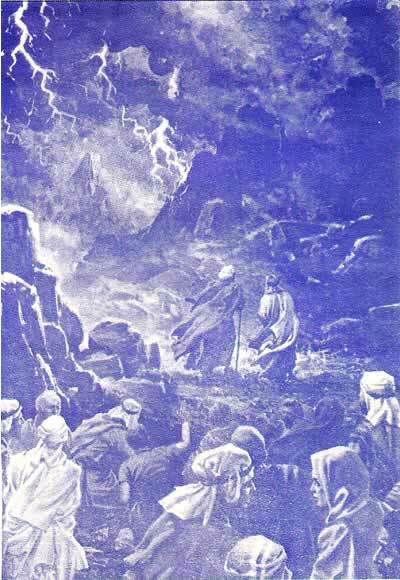 "Soon after the encampment at Sinai, Moses was called up into the mountain to meet with God. Alone he climbed the steep and rugged path, and drew near to the cloud that marked the place of Jehovah's presence. Israel was now to be taken into a close and peculiar relation to the Most High, – to be INCORPORATED AS A CHURCH AND A NATION under the government (laws) of God." – Patriarchs and Prophets, p. 303.
church is in the wilderness as Israel was in the wilderness in the days of Moses. " . . . the experiences of ancient Israel under the Exodus movement were a type of the experiences of modern Israel under the Advent movement. They are parallel movements. " – Forty Years in the Wilderness, by Elder Taylor G. Bunch. "The sin of ancient Israel was in disregarding the expressed will of God . . . . Modern Israel are fast following in their footsteps. . . " – Testimonies, vol. 5, p. 94. 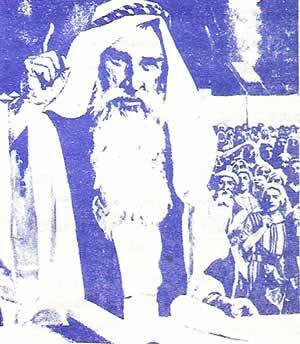 The main difference between Israel in Moses' day, and Seventh-day Adventists today, is that Israel had a living prophet, Moses. Seventh-day Adventists are without a living prophet. Like other Protestant churches, they have only the writings of the dead prophets. However, the remnant church is to have the gift of prophecy, the living testimony, in her midst "Till we all come in the unity of the faith, and of the knowledge of the Son of God, unto a perfect man, unto the measure of the stature of the fullness of Christ." – Eph. 4:13. "Let it be borne in mind that God has set prophets. . . in the Christian church as verily as he has teachers, helps, and governments . . . . He had established them in the church, to remain until the return of her absent Lord. This was done because the church needed them. Did the primitive church need them? . . . And much more does the church need the gifts in pressing her course through the perils of the last days. "The design of the gifts, and also the time of their continuance in the church, are definitely expressed by the apostle to the Ephesians. . . . Chap. 4:11-13." "The church today is almost infinitely below this state of unity, knowledge, and perfection. And not until the Christians of the last generation of men shall be brought to the enjoyment of it. . . will the ultimate design of the gifts be realized. "The gifts. . . were all to reach to the same point of time. Were evangelists, pastors, and teachers to continue to the end? So was the gift of prophecy. . .
Seventh-day Adventist church is incorporated under the civil laws of the United States Government. God appointed Moses as His vicegerent, but the President of General Conference is only a religious leader appointed by the people and without the gift of Inspiration. Sister White states: "Moses said, 'When they have a matter, they come unto me; and I judge between one and another, and I do make them know the statutes of God, and His laws.' This work is still to be done. . . " – Testimonies to Ministers, p 341. It is God's purpose today to reestablish His theocracy with His people. "THIS WORK IS STILL TO BE DONE. . . " – Testimonies to Ministers, p. 341. After The Destruction of Jerusalem in 70 A.D. Centuries before the coming of the Messiah, Israel lost her civil crown when Zedekiah refused to listen to the voice of God through Jeremiah (Jer. 32:3-5; 52:4-13). Then, when the Messiah came, Israel rejected Him and, as a result, lost both her civil and religious authority. However God said: "I will overturn, overturn, overturn, it: and it shall be no more, until he come whose right it is; and I will give it him." – Ezek. 21:27. Because of her sins, Israel prepared the way for the fulfillment of Daniel's prophecy, "Behold, in this horn were eyes like the eyes of man, and a mouth speaking great things . . . . And he shall speak great words against the most High, and shall wear out the saints of the most High, and think to change times and laws: and they shall be given into his hand until a time and times and the dividing of time." Dan. 7:8, 25. "Just as God chastened her in olden time by permitting Nebuchadnezzar, king of Babylon, to abolish the ceremonial system by destroying ancient Jerusalem and its temple, just so did He chasten her in the Christian era by permitting Rome to gain control over her (take her religious rule) and to supplant her true religious system by a counterfeit – a pagan priesthood and a pagan sabbath." – The Latest News for Mother, p. 25. But this was to be only until "the judgment was set, and the books were opened." – Dan. 7:10. The time the judgment of the dead began was at the Atonement in 1844. This time was calculated by the prophecy, "And he said unto me, Unto two thousand and three hundred days; then shall the sanctuary be cleansed." – Dan. 8:14. At that time, in 1844, God restored the religious rule to the seed of Abraham when He endowed Ellen G White with the gift of prophecy and gave her a world-wide message – the Third Angel. In answer to those who called her a prophetess, Ellen G. White stated, "My work includes much more than this name signifies." – Selected Messages, book 1, p. 36. Indeed, this is true. She was destined to be the religious governor of the church. The little horn power (the papacy) lost his civil crown in 1530 when Martin Luther presented his Confession of faith at Augsburg which the ten governors signed, relieving the pope of his civil authority. The sword of Truth severed the little horn (that had eyes) from the head (Dan. 7:8) and it could no longer see, and as a result, in 1798 the pope was imprisoned. "And I saw one of his heads as it were wounded to death." – Rev. 13:3. "When the Israelites first settled in Canaan, they acknowledged the principles of the THEOCRACY, and the nation prospered under the rule of Joshua." – Patriarchs and Prophets, p. 603. "The time had come, and David, by solemn rite, was consecrated to his office as God's VICEGERENT. The scepter was placed in his hands. " – Ibid., p. 702. Just because Israel wanted a king like the other nations in the days of Saul, God did not allow a change of His Representative before the Kingdom. His Representative was still to be a theocratic Governor, a Vicegerent; in other words, a civil and religious ruler, not only of the nation, but of the church as well. He was to be the visible Representative of God to the church and the nation because this plan was established at Sinai under Moses, and God would allow no change in the principles of the kingdom. When the term, "vicegerent," is mentioned most Seventh-day Adventists think of the pope and Rome. True, the pope is a religious and civil leader over Vatican City under Rome's laws. "Thus the pope came to be almost universally acknowledged as the vicegerent of God on earth, endowed with authority over church and state." – The Great Controversy, p. 51. It is a clever trick of Satan to counterfeit God's glorious form of Government for His saints on earth just before Jesus comes the second time (1 Thess. 4:16). The enemy has cunningly perverted the idea of God's theocratic government to the extent that those teaching a Theocratic Kingdom before His second coming are considered heretics. "Theocracy" applies to God's Sovereignty over His people with a vicegerent through whom He rules as in the days of Moses, David, and, in the near future, through the antitypical David when He gathers the twelve tribes of Jacob back to New Jerusalem in their homeland. "For the children of Israel shall abide many days without a king, and without a prince, and without a sacrifice, and without an image, and without an ephod, and without teraphim: Afterward shall the children of Israel return, and seek the Lord their God, and David their king; and shall fear the Lord and his goodness in the latter days." – Hosea 3:4, 5. From the weight of evidence we then will have to take these facts into consideration in our position and stand on Pentecost. "In the third month . . . the same day came they into the wilderness of Sinai." – Ex. 19:1. Moses and the children of Israel were at Sinai in the third month according to the Scriptures. You may look in a Jewish calendar at the third month, and you will find that God gave the law of Ten Commandments and the "book of the law" at Sinai at that time. Jewish scholars recognize that this occurred on the day of Pentecost, or Feast of Weeks (Lev. 23:15-17, 21). Seventh-day Adventists would do well to consider what happened at Sinai in the wilderness in Moses' time, so that they may know what to expect from the Lord at Pentecost while they are still in the wilderness, in the land of the Gentiles. "And mount Sinai was altogether on a smoke, because the Lord descended upon it in fire. . ." – Ex. 19:18. "And when the day of Pentecost was fully come, they were all with one accord in one place. And suddenly there came a sound from heaven as of a rushing mighty wind, and it filled all the house where they were sitting. And there appeared unto them cloven tongues like as of FIRE, and it sat upon each of them." – Acts 2:1-3. Notice the different locations of the fire. In Moses' day the fire was upon Mount Sinai and in the days of the disciples the fire was upon the disciples on Mount Zion. The difference was that the people in Moses' day were in the wilderness, not in the promised land, and were not a purified people. "And Moses said unto the Lord, The people cannot come up to mount Sinai: for thou chargedst us, saying, Set bounds about the mount, and sanctify it." – Ex. 19: 23.
from their midst at the time of the Lord's Passover. Afterward, the fire came and sanctified the 120 disciples in Jerusalem, in the land of Israel. Today the tares and wheat are still commingled in the Seventh-day Adventist church. Therefore, the Pentecost in Jerusalem where the saints were holy, without a tare in their midst, is not our type, now, while the church is still in the wilderness, in the Gentile lands. Our type for Pentecost, then, must be the type of Moses and the children of Israel at Mount Sinai (Isa. 11:16). The only type of Pentecost the Seventh-day Adventist church could receive today is the same kind of Pentecost that Moses and the children of Israel experienced in the wilderness at Sinai. There, God the Father, and Jesus, the Son, came down upon the Mount in fire and delivered the law of Ten Commandments and the Law of the Sanctuary – the Book of the Law. At this time, the Lord set up a theocratic government established and organized under His two divine laws (Patriarchs and Prophets, p. 303). Pentecost comes in the third Hebrew month, but Joel 2:23 says: ". . . and he will cause to come down for you the rain, the former rain, and the latter rain in the first month." Here Joel says that this rain comes in the first month. "And the Lord spake unto Moses and Aaron in the land of Egypt, saying, This month shall be unto you the beginning of months: it shall be the first month of the year to you." – Ex. 12:1, 2. The Lord told Moses that the month of the Passover was the first month. Joel 2:23 must be speaking of the latter rain that comes just before the Passover, then the harvest immediately follows. This rain matures the wheat and ripens it for the harvest. Pentecost is at the end of the first fruit harvest and it comes in the third month. "Ye shall bring out of your habitations two wave loaves (offering for Pentecost) of two tenth deals: they shall be of fine flour; they shall be baken (fire, Holy Spirit) with leaven; they are the FIRSTFRUITS unto the Lord." – Lev. 23:17. Therefore, the wave sheaf offering (Lev. 23:11) at the Passover season in the first Jewish month Abib is the beginning of the first fruit harvest. This harvest terminates in the third month at the Feast of Weeks offering of two wave loaves (first fruits, Lev. 23:15-17,21), on the day of Pentecost (Joel 2:28; Acts 2:1-4). Since the wave loaves (first fruits) represent souls, we have the 120 representing the wave loaves (first fruits) on the Apostolic Pentecost, and the 144,000 representing the wave loaves (first fruits) on the latter day Pentecost. "And I looked. and, lo, a Lamb stood on the mount Sion, and with him an hundred and forty and four thousand....being the firstfruits (wave loaves) unto God and to the Lamb." – Rev. 14:1,4. The message of the Investigative Judgment of the Living, the harvest in the church (Joel 2:24-27), comes after the Latter Rain of Truth (Joel 2:23). "The latter rain, falling near the close of the season, ripens the grain, and prepares it for the sickle (harvest – Investigative Judgment). The Lord employs these operations of nature to represent the work of the Holy Spirit (messages of Inspiration)." – Testimonies to Ministers, p. 506. We can see Joel 2:23 must be speaking of something other than the Pentecostal outpouring of power spoken of in Joel 2:28. This is true because verse 28 follows after Joel 2:24 which speaks of the harvest, "And the floors shall be full of wheat, and the fats shall overflow with wine and oil." Moses speaks of the doctrine as being like rain. "Give ear, O ye heavens, and I will speak; and hear, O earth, the words of my mouth. My doctrine shall drop as the rain, my speech shall distil as the dew, as the small rain (former rain) upon the tender herb, and as the showers (latter rain) upon the grass." – Deut. 32:1, 2. "The latter rain, ripening earth's harvest, represents the spiritual grace that prepares the church for the coming of the Son of man (in judgment, Rev. 14:14, 16). But unless the former rain (seeds of Truth by Ellen G. White) has fallen, there will be no life; the green blade will not spring up. Unless the early showers have done their work, the latter rain (of truth, Joel 2:23; Rev. 14:15) can bring no seed to perfection." – Testimonies to Ministers, p. 506. In Deuteronomy 32:2, the Lord says His "Doctrine" shall drop as the "rain". At the Atonement, in the autumn of 1844, the Third Angel's Message came as the former rain (Judgment of the Dead) by Ellen G. White. The showers that come in the spring of the year to ripen the grain for the harvest is represented by the latter rain message of Joel 2:23. It was brought by Victor T. Houteff in the spring of 1929 to effect a reformation within the Seventh-day Adventist Church and prepare her for the Harvest – Judgment of the Living. This is the message of the fourth angel. "And another angel came out of the temple (from the judgment scene), crying with a loud voice to him that sat on the cloud, Thrust in thy sickle, and reap: for the time is come for thee to reap; for the harvest of the earth is ripe." – Rev. 14:15. Revelation 14:14, 15 is the Fourth Angel's Message. "This is symbolized by the message of prayer of the fourth angel of Rev. xiv, 15." – Spiritual Gifts, vol. 3, p. 23. This must be what Sister White had reference to when she wrote, "Unless we are daily advancing in the exemplification of the active Christian virtues, we shall not recognize the manifestations of the Holy Spirit in the latter rain. It (the latter rain MESSAGE, Joel 2:23) MAY BE FALLING ON HEARTS ALL AROUND US, BUT WE SHALL NOT DISCERN OR RECEIVE IT." – Ibid., p. 507. Conclusively, then, this latter rain is a rain of pure truth, which, if received, will prepare the church for the harvest of the 144,000 first fruits (Joel 2:24-27). After this harvest will come the latter rain of power (Joel 2:28) and finally, the great harvest for the world (Rev. 7:9). This is why some have received the Davidian message as a manifestation of the Holy Spirit and others know it not. But when Joel 2:28 (Latter Rain of POWER) comes after the harvest of 144,000 first fruits and falls upon them, the whole world will know about it. The Important Event of 1970! What Really Happened? Accordingly, June 14, 1970, both The Branch Davidian Seventh-day Adventist Headquarters at New Mt. Carmel Center, Waco, Texas, and the General Conference of Seventh-day Adventists' World Session in Atlantic City, New Jersey, called for a PENTECOST. Both were right as to the date, but the General Conference misunderstood the event. The General Conference called for the outpouring – the miracle working power, the Pentecostal energy. But The Branch at New Mt. Carmel Center under the authority of the Fifth Angel's Message of Rev. 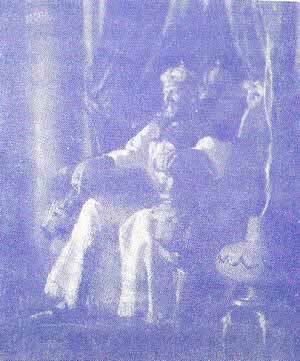 14:16-20 called for the Coronation of their President as Vicegerent of the Most High who received both the civil and religious crown. 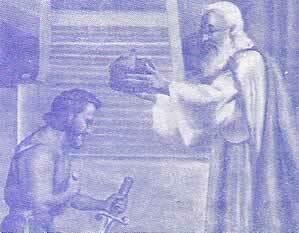 This crown God gave to David when he was coronated by the two tribes in Hebron. "And the men of Judah came, and there they anointed David king over the house of Judah." – II Sam. 2:4. Ellen G. White states: "The time had come, and David, by solemn rite, was consecrated to his office as God's vicegerent . . . . Israel had a king by divine appointment." – Patriarchs and Prophets, p. 702. Several hundred years before David, God established the theocracy in Israel through Moses as His vicegerent. We can see a parallel between the Pentecost (coronation) June 14, 1970, and the events in Israel when Saul died and David was coronated over the house of Judah in Hebron. For information on the General Conference World Session of 1970, read the Review and Herald, June 21, 1970. While the General Conference, in World Session, was embarking on a new era of reformation on the very day of Pentecost, The Branch at New Mt. Carmel Center, Waco, Texas, coronated its President over Judah, as vicegerent of the Most High God. "Then shall the children of Judah and the children of Israel be gathered together, and appoint themselves one head, and they shall come up out of the land: for great shall be the day of Jezreel." – Hos. 1:11. The Lord says, "To him that overcometh will I grant to sit with me in my throne, even as I also overcame, and am set down with my Father in His throne." – Rev. 3:21. In the type, on the day of the Feast of Weeks offering (Shavuot) or day of Pentecost, God crowned Moses as His vicegerent, the one who was to receive His laws and represent Him on the earth. Moses was called up into Sinai in the third month on the day of Pentecost to receive the laws of God with which to govern Israel. "God purposed to make the occasion of speaking his law a scene of awful grandeur, in keeping with its exalted character." – Patriarchs and Prophets, p. 303. "Moses was a type of Christ. He himself had declared to Israel, 'The Lord thy God will raise up unto thee a Prophet from the midst of thee, of thy brethren, like unto me; unto him ye shall hearken.' " – Ibid., p.480. So it was, on the day of Pentecost in Acts 2:1-4, Jesus was coronated in His mediatorial kingdom. Therefore, on the antitypical day of Pentecost, when God crowns antitypical David over all twelve tribes of Israel (the 144,000), He will pour out His Spirit in such glorious abundance, the like of which, the world has never seen. David will be king over them. They will receive crowns of fire, and as governors they will evangelize the whole world in the Loud Cry of Revelation 18:1-4. At this time, the Lord will be over Jerusalem in a cloud by day and a flaming fire by night (Isa. 4:5) and the original language, lost at the Tower of Babel, will be restored. These events should clarify the meaning of the Pentecost to the church in the wilderness today and anciently. "And the woman fled into the wilderness, where she hath a place prepared of God, that they should feed her there a thousand two hundred and threescore days." – Rev. 12:6.
yards from thence, and the valley of Achor for a door of hope: and she shall sing there, as in the days of her youth, and as in the day when she came up out of the land of Egypt . . . . Afterward shall the children of Israel return, and seek the Lord their God, and David their king; and shall fear the Lord and his goodness in the latter days." Hos. 2:14, 15; 3:5. The foregoing Scriptures outline briefly church history "to" and "back" from the wilderness. The "woman" or church fled into the lands of the Gentiles, the "wilderness," for a specified time during which she was without the civil crown, the "king." While yet in the wilderness, His people recognize His appointed Vicegerent, who, like Moses, is crowned with the civil-religious crown. Then Inspiration shows that His people "return," go back to the land of Israel, and that this takes place in the "latter days" – the time in which we now live! Praise the Lord for His unceasing care for His church down through the ages, and for His workings to restore the kingdom with the civil-religious crown again to His people! Much has been written concerning the glorious message of the Angel, Who joins the third angel. Sister White says of this Angel, "Then the Angel, who is Christ Himself, the Saviour of sinners, puts to silence the accuser of His people. . . " – Testimonies, vol. 5, p.469. "Then I saw another mighty angel commissioned to descend to the earth, to unite his voice with the third angel, and give power and force to his message. . . " – Early Writings, p. 277. A volume could not contain the explanations observed by Inspiration on what she has written about this mighty Angel. Remember, her writings are a product of the Holy Ghost and since she is not living, the same rule of interpretation must apply to her writings as to the prophets of old. "To the law and to the testimony: if they speak not according to this word, it is because there is no light in them." – Isa. 8:20. "Surely the Lord God will do nothing, but he revealeth his secret unto his servants the prophets." – Amos 3:7. The Acts of the Apostles, p. 39. speaks of Jesus as being inaugurated. Christ's Object Lessons, p. 120, tells of His coronation in His mediatorial kingdom on the day of Pentecost, 31 A. D. in the third month, at the third hour (Acts 2:15). the Lord, and all the Gentiles, upon whom my name is called, saith the Lord, who doeth all these things." – Acts 15:16,17. Let none spiritualize away either the throne of David or the kingdom in the land God promised to Abraham. Take heed to Inspiration's warning: "I have often seen that the spiritual view took away all the glory of heaven, and that in many minds the throne of David and the lovely person of Jesus have been burned up in the fire of Spiritualism." – Early Writings, p. 77. "Afterward shall the children of Israel return (to Jerusalem), and seek the Lord their God, and David their king; and shall fear the Lord and his goodness in the latter days." – Hos. 3:5. This would necessitate the Pentecost being held in Jerusalem, the city of the great king. "And the Lord said unto Satan, The Lord rebuke thee, O Satan; even the Lord that HATH CHOSEN JERUSALEM rebuke thee." – Zech. 3:2. "Zechariah's vision of Joshua and the Angel applies with peculiar force to the experience of God's people in the closing up of the great day of atonement." – Testimonies, vol. 5, p. 472. God chooses Jerusalem, today, in the Judgment of the Living, the closing work of the Atonement, our day! Messiah will soon be in His kingdom in a cloud by day and fire by night, "And the Lord will create upon every dwelling place of mount Zion and upon her assemblies, a cloud and smoke by day, and the shining of a flaming fire by night: for upon all the glory shall be a defence." Isa. 4:5. ". . . like as it was to Israel in the day that he came up out of the land of Egypt." – Isa. 11:16. Dear friends, we cannot afford to hold to some of our previous views on which the Third Angel's Message gave no light. Let us hold fast to all the wonderful truths of the Third Angel's Message (brought by Gabriel) and plead with God for an understanding of that glorious message of the Angel (Who is Christ Himself), Revelation 18:1, Who joins the Third Angel and liberates God's people from the mark of the beast. "Thus saith the Lord; If ye can break my covenant of the day, and my covenant of the night, and that there should not be day and night in their season; Then may also my covenant be broken with David my servant, that he should not have a son to reign upon his throne. . . " – Jer. 33:20, 21. Praise the Lord! The beautiful message of the Angel of Revelation 18:1 has come to tell us of the throne of David and the kingdom, to join the Third Angel's Message, and give it power and force. Since the number of the beast 666 (Rev. 13:18) is not complete (777), it shows there will be a place where God's people can buy and sell without receiving the mark of the beast. "Behold, I will gather them out of all countries (in the latter days, Jer. 30:24; Hos. 3:5), whither I have driven them in mine anger, and in my fury, and in great wrath; and I will bring them again unto this place, and I will cause them to dwell safely." – Jer. 32:37. ". . . in the days of these kings shall the God of heaven set up a kingdom (in the land, on earth, God promised to Abraham, Isaac, Jacob, and his seed). . . " – Dan. 2:44. "Men shall buy fields for money, and subscribe evidences, and seal them, and take witnesses in the land of Benjamin, and in the places about Jerusalem, and in the cities of Judah, and in the cities of the mountains, and in the cities of the valley, and in the cities of the south: for I will cause their captivity to return, saith the Lord." – Jer. 32:44. "Turn, O backsliding children, saith the Lord; for I am married unto you: and I will take you one of a city, and two of a family, and I will bring you to Zion." – Jer. 3:14. "Since, therefore, from the 'stem' of Jesse came the 'rod' (David), and from the rod sprang the Branch (Christ), David the visible king and Christ the invisible King of kings shall 'in that day' – in our time – constitute the 'ensign,' ('Branch and rod' – p. 46) and 'to it shall the Gentiles seek: and His rest [or His resting place, – the location where the 'rod' or ensign stands – the kingdom] shall be glorious.' Yea 'I will make the place of My feet glorious' (Isa. 60:13), saith the Lord." – Mount Sion at the Eleventh Hour, p. 47.
descended upon it in fire . . ."